Personalized Gifts - Custom 3D Bookmarks & Donor Gifts for Sale | Marbex Inc.
There’s something a traditional book can offer for which none of the modern electronic ‘advances’ can substitute. The entire experience of sitting down, opening a book and turning the pages is a tradition as old as modern civilization. Even the smell of the pages and the glue binding contributes to the adventure. Reading a book the old fashioned way is studious, timeless and dignified. Such a time honored tradition as relaxing with book, conceived long before the internet and technology age, is valuable for so much more than enjoying fine literature. And something as dignified as sitting down and reading a book as the world passes you by should be treated as such. So that ratty receipt for a cup of coffee you bought for months ago simply won’t do. Buying your loved one or work colleague a bookmark they could take pride in makes all the difference. Perfect for displaying your company name, individual name or even a likeness to a favorite author, fully custom etched metal PageMarker bookmarks act as a quality platform for any number of reminders or memories. 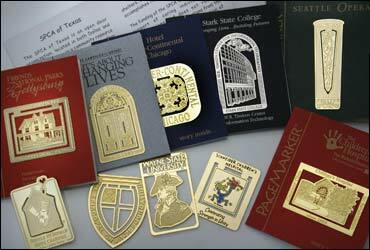 Marbex in particular takes the time to precisely engrave the design of your choice to your liking. Regardless of the detail of the logo or building you need etched, you can rest easy knowing that above all else, the team at Marbex Inc. places an emphasis on quality. In addition to our years of experience, we place the needs of our customers before all else. No matter what type of bookmark you need, we are here to make it a reality.Click now to shop online! 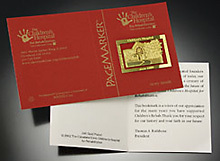 For more information about custom bookmarks, ornaments, or any of our other gifts, contact us today. Front and back of Custom Bookmark on packaging.